There are three major pieces of cricket equipment for a wicket keeper and all of them are stocked in abundance by Cricket Store Online. These are the wicket keeper gloves, wicket keeper pads and wicket keeper inners for the gloves. There are various qualities in cricket wicket keeping equipment and we offer a wide range of prices. By consistently updating our stock we are able to being wicket keepers the newest wicket keeping gear at highly competitive prices. We only stock keeper gloves that conform to the ICC standards for the size of the webbing. When it comes to wicket keeper gloves it is the quality of the raw material that ultimately determines how good the cricket wicket keeping glove is. There is no topping Kookaburra wicket keeping gloves and GM wicket keeping gloves in terms of the high quality material that they use. 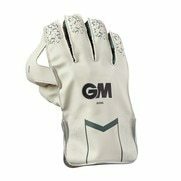 There are however a wide variety of manufacturers producing top quality wicket keeping gloves. There are generally two variations when it comes to the cuff on the wicket keeper gloves. Some like the Australian style short cuff while others enjoy the more traditional long cuff. Gone are the days when a keeper would have to keep wicket in a pair of batting pads. Cricket Store Online stocks some of the best quality and most comfortable wicket keeper pads available. These pads have additional soft padding in the Velcro straps to ensure the keeper is comfortable even after spending many hours in the field. A keeper needs to be nimble in the crouch and quick on their feet, all of these pads afford that while still offering the necessary protection. Wicket Keepers need to wear inners when they keep wicket. We stock a wide variety of high quality cotton wicket keeping inner gloves. It is worthwhile for a wicket keeper to own more than one of these to ensure that should a pair get sweaty or fray they have another on quick standby. The quality of the inner gloves has spiked immensely in recent years and of course we are here to bring you all the best wicket keeping equipment out there. By stocking a wide variety of stock with many different price points and sizes to fit juniors, Cricket Store Online is able to bring you the best deals on cricket wicket keeping gear with bargains galore when the new stock comes in. With worldwide shipping on the gear and with a highly competitive price point, wicket keeping gear sells quick so make sure to grab yours as soon as possible.